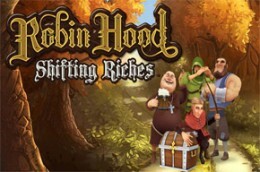 As the name already suggest it, Robin Hood Shifting Riches is a video slot that tells the story of the legendary character – Robin Hood. The game was released in 2011 by Net Entertainment and is a 5 reels, 3 rows, and 20 paylines video slot. The lower value symbols are the standard playing cards, while the higher value symbols are a knight in armour, Little John, Maid Marion, Friar Tuck and Robin Hood himself. The wild symbol is represented by the Robin Hood logo.